Well, that was fun. I feel we're all better people for going through that. Sincerely, we've enjoyed all of your correspondence. It's uplifting to know that we all have a sense of humour at times like these. Please join us at 13:30 GMT tomorrow for build up to qualifying - don't forget to put your clocks back! I wonder what the decision will be...? Red Bull boss Christian Horner speaks on BBC Two about their engine situation: "Nothing further to add at the moment. We are making some headway and I hope we find a solution in the coming days. There are four engine suppliers in F1 at the moment - so Honda a 25% chance." While Suzi and David chat about the day's events, we'll take a look at some of the highlights, including the Williams team doing Oops Upside Your Head. You can also watch the 'highlights' programme at 21:45 BST by clicking the Live Coverage button on this page. Regardless of what happens, the scheduled highlights programme will now become a live show at 21:45 BST on BBC Two. If qualification is called off at 22:00 BST, that might be all we get.. watch this space. Right. There's a bit of confusion among the masses - so I'm going to break it down for you real good. Austin is currently six hours behind UK time (BST). But tomorrow, UK clocks go back an hour (to GMT), which means the time gap is five hours. So the proposed time if 09:00 local time for qualifying is 14:00 GMT UK time. I have a terrible, awful feeling that at 21:55 BST the rain will stop and they'll start uncovering the tyres. Is there an emoji for delirium? There's a little bit of good news. But it's mainly bad news. The geniuses in Austin are saying if there is no break in the weather by 22:00 BST, qualifying will be abandoned and we will try again at 14:00 GMT on Sunday. We have 45 minutes of this madness remaining. I may have to start eating my own arm to survive. I realised I forgot to include a picture of James Marsden when I said I would earlier. Here he is to make up for it. Here's a reminder of the timings for tomorrow's action. There could be qualifying some time early afternoon British time. The race is scheduled for 19:00 GMT - REMEMBER THAT THE CLOCKS GO BACK IN THE UK. - My Sport is easy to set-up and edit. You can add or remove topics, and re-order. I hope you're right Andrew. Otherwise I might lose the plot. Of course it is. Bernie's just having a laugh now. If you're still with me, thank you. We are soldiers together in this war against F1 ridiculousness. If you're new to our club, so far we have discussed Strictly Come Dancing, James Marsden (pictured) and canoeing. We also sometimes chat about Formula 1. We have a winner ladies and gents. Goodnight everyone! Here are those grown men rowing down a pit-lane. I applaud you gentlemen. Pick your way through some cracking Austin stats here. I'm not sure about the claim of having 300 days of sunshine, mind. If you read it really slowly, I can nip for a toilet break. It's the live texter's equivalent of playing Bohemian Rhapsody. Niki Lauda and Nico Rosberg are having a bit of a kickabout. I have nothing humorous to add - sorry. A bit of news you may have missed amid all the non-stop action. British driver Jolyon Palmer will drive for Lotus next year, partnering Pastor Maldonado. It's been delayed by another 30 minutes, pushing us back to 21:00 BST by my calculations. Tell my wife and daughter I love them, I fear I will never see them again. Mercedes chief Niki Lauda tells BBC Sport: "The rain is so hard that no wet tyre can take the cars round safely. Why we are all wasting our time for delays, delays, delays? Tomorrow we are going to have a race." We are 70 minutes past the original qualifying start time. It's still heaving it down. There are men in yellow cagoule pumping water off the track. Grown men are canoeing in a bucket on wheels down a pit-lane. Surely, SURELY, it's time to admit defeat. There is no shame in quitting. "The safety cars do not aqua plane anything like a grand prix car would, they are able to cut through the water where a grand prix car would be lifted up." It was so long ago, it's probably worth reminding ourselves of the times from final practice earlier today. If there is no qualifying session (today or tomorrow) these times will determine grid positions. The US Grand Prix has peaked. Let's all pack up and go home. Thank you Matt Le Blanc. What's going on? Everyone's lost the plot. Daniel Ricciardo and Daniil Kvyat are out in the pit-lane dancing together. Is it a waltz? I'm not one for dance genres. The engineers have resorted to entertaining themselves now. One chap from Force India starts banging out some sick break dance moves. We've really reached the depths of F1 qualifying boredom now. “Much of the off-track chat this weekend has been about engines one way or another. Partly about the new plan to introduce cheap 2.2-litre engines and pincer the manufacturers politically (which we mentioned below), but also about Red Bull’s engine supply. "They are pursuing three options - a Ferrari of one description or another, a Renault (probably unbadged) and Honda. McLaren has a contractual veto over the identity of any second team Honda supplies next season, and they want to use it to stop Red Bull getting the engine. "And Honda F1 boss Yasuhisa Arai told BBC Sport on Friday that supplying Red Bull would ‘realistically be very difficult because it is late October’. Other sources say Honda is potentially up for it. "In which case Ron Dennis would have to make a call on whether he wants to upset his engine partner - which is contributing a net $100m to the team a year in terms of budget. I'm more than happy to talk about Strictly Come Dancing while the rain continues. I thank you all for keeping me entertained during this dullest of times. Use #bbcf1 on Twitter to get involved. "I suspect if the people at Race Control were standing out in the rain they would make a quicker decision than from their nice comfortable position." What's the greatest wet grand prix of all time? Let's have it - use #bbcf1 on Twitter to get involved. That is some cracking ice-cream action right there. Nico Hulkenberg tells BBC Sport: "Really happy with the balance in the car, felt really comfortable, there was some aqua planing in places but we were competitive. "At the moment it is just not possible to race, we've just got to be ready and on the money when the call comes." “If this carries on, qualifying will be on Sunday morning at 0900 (local time). However, if it cannot be run then, the grid will be decided on the times from final practice. "In which case, McLaren will be kicking themselves. Fernando Alonso was fifth fastest and Jenson Button ninth after the first few laps of the session, but the team brought them in to make set-up changes, rather than just pounding round as almost everyone else did. We started this live text commentary 88 minutes ago, and the only thing we've been able to talk about is rain and Daniel Ricciardo's jeans. The TV to my right is showing Strictly Come Dancing... I'm so starved of action I'm tempted to describe Ainsley Harriott's jive. "Lewis Hamilton timed his lap beautifully and it was a masterclass of how to drive in the rain." Lewis Hamilton was superb in final practice, blowing everyone else away. And guess what, you can watch the highlights of that session right here. The weather forecast for Sunday's raceday is better, but not great. Get the full report here in video form. Why did Jenson Button take a wetsuit to Austin? And how did he get to the beach so quickly? Red Bull's Daniel Ricciardo, wearing a pair of jeans and sipping a cup of tea, yells BBC Sport: "Unless the rain settles we're not going to run. If the rain continues it's just logic we won't run today. Even if it just drizzles we can't go out there. I'm sure we'll run tomorrow." If you're just tuning in to read about some red hot qualifying action, you'll be disappointed to know that all we have is grey, tepid non-existent action. That's because it's chucking it down in Austin. The FIA have optimistically pushed qualifying back to 19:30 BST. If there is no qualifying today, they could try and give it a go tomorrow morning before the race. If that isn't possible, they will use the times from final practice to decide the grid - which would mean Lewis Hamilton would be on pole. In the mean time, we may have to start talking about James Marsden again to pass the time (loyal readers throughout the weekend will know what I'm on about). Spa in 1998 is proving popular in the category of best wet race. You can refresh your memory by watching highlights here, if you're starved of race action (UK users only). Get involved in the chat by using #bbcf1 on Twitter. The home straight resembles a steadily flowing stream at the moment. There is lots of movement in the car park at the Circuit of the Americas - I can't quite tell if it's people giving up and heading for home. It's probably a sensible idea. "There are reports that F1 boss Bernie Ecclestone and FIA president Jean Todt are planning to introduce a cheaper engine to run alongside the current turbo hybrid V6s. "They are looking at a 2.2-litre twin turbo and an equivalence formula. It is no coincidence that it's the engine that is run in IndyCars at the moment - one of which is built by British company Ilmor. A 19:30 BST start is looking optimistic, if that image is anything to go by. We're asking for your craziest wet-weather grands prix - and your own scary drives in the weather. Scratch that - qualifying is now set to start at 19:30 BST. Honda confirming what we were hearing - start time pushed back to 19:15 BST. As we await a slightly delayed qualifying session, why not tell us about your most memorable rain-affected grand prix? Also, what are the craziest conditions you've ever faced in the car? Get involved using #bbcf1 on Twitter. In case you weren't around, here are the times from that final practice session. Lewis Hamilton was almost a second quicker than nearest rival Sebastian Vettel, who will endure a 10-place grid penalty for exceeding the permitted number of engine changes. You can read more about the session here, in Andrew Benson's report. It's also been a weekend for social media milestones for Hamilton, who has notched up 3,000,000 Twitter followers. Anyone remember Mario Paint for the SNES? It looks like Hamilton pulled this terrific picture together using that. So far the signs are good that this could be a weekend to remember for Lewis Hamilton. He was by far the best in the wet conditions of final practice. Here is how he can become the first Briton to win back-to-back titles and only the second, after Jackie Stewart, to win three. Our chief F1 writer Andrew Benson is hearing there could be a 15-minute delay to the start time. There are still 40 minutes to go until qualifying, but it's not looking good. One of the more curious aspects of today's earlier practice session, was that it was played out in front of empty stands. The Circuit of the Americas decided it was too unsafe to allow spectators into the venue. The FIA decided it was safe enough to drive metal machines around at immense speeds. The fans are coming in now - will they get to see any moving cars? I'm looking at pictures of the pit-lane. At least I think it's the pit-lane. It could be a water slide at a fancy Spanish hotel resort. I keep expecting Kevin Costner to pop up and find out I'm actually watching Waterworld. Here's an update from Autosport's Lawrence Barretto. It's teeming down in Austin - still no news. Welcome back one and all. We're one hour away from the scheduled start time of qualifying at the US Grand Prix - and as things stand, qualifying is set to start on time. Lewis Hamilton was quickest in final practice - by far the quickest. If qualifying doesn't happen, it could be moved to Sunday morning. Otherwise, the times from FP3 will be used to decide the grid. So, will we have any action in wet and wild Texas? It's time to take a break and dry off. We, like the teams, are just going to go ahead and assume that qualifying will happen at 19:00 BST. So you can join us from 18:00 BST for all the build up. In the mean time, take a look at Andrew Benson's assessment of that thoroughly enjoyable session. Lewis Hamilton is obviously the main man after that session - Sebastian Vettel was 0.863secs behind the Mercedes driver. After that the intervals are just tenths of a second - nobody could touch the world champion. Vettel will be delighted if that proves to be the grid placing - his 10-place penalty means he'll only be 11th. But Nico Hulkenberg deserves a special mention. The Hulk was consistent throughout to come in P3, more than two seconds quicker than his Force India team-mate Sergio Perez. Yeeha! Romain was P12 in that session, by the way. Qualifying is still scheduled to start at 19:00 BST. The times in FP3 will only have a bearing on grid positions if qualifying doesn't happen. And even if it is called off today, there remains the option to run qualifying on Sunday morning. So we won't find out any time soon how important that session was. So, assuming nobody is feeling like a maverick and wants to burst out of the pits in the next two minutes, this is how FP3 looks. Lewis Hamilton is in the garage, looking extremely relaxed. Sebastian Vettel is sat down doing a bit of paperwork, Fernando Alonso is chatting with engineers. Sergio Perez is sat in his car in the garage, staring at a picture of the Pope. (Honestly, that's what he's doing). We have six minutes remaining - but it's fair to say FP3 is over. Wrestling references are welcomed, nay, encouraged. The few drivers out on the track are testing out strategies, rather than pushing for times. Daniil Kvyat has just pitted, while Marcus Ericsson and Max Verstappen are ploughing through the puddles. There are still no spectators in the Circuit of the Americas. It's worth noting just how good that fastest lap from Lewis Hamilton was. He is almost a second quicker than anybody else. If this does become the weekend he wraps up the title - he will have done it by re-enforcing his reputation as a maestro in the wet conditions. Contrasting approaches on show. Nico Rosberg goes out, but Mercedes decide it is too treacherous and call him straight back. Force India ask Nico Hulkenberg is he can manage one more lap - "It should be fine," he says. Now then boys. Conditions are worsening, but you have 20 minutes left of what could turn out to be qualifying - what have you got left in the tank? Red Bull have improved slightly - Daniil Kyvat is up to sixth and Daniel Ricciardo is eighth. The Australian is currently on the track. Shaky moments for Sebastian Vettel, who survives one little wobble through the wet, but can't survive a second miscalculation and spins. He then, curiously, reverses down the track a few yards, a bit like he's doing a manoeuvre on his practical test. "The conditions are quite bad," he tells his Ferrari team. The German is still second, mind. Lewis Hamilton, on the weekend he could seal a third world title, is the first man to break two minutes, recording a 1:59.517. We have 28 minutes of FP3 remaining. Susie Wolff, the Williams test driver, is looking happy as Larry in the rain. It's Nico Hulkenberg and Valtteri Bottas who are looking the danger men. Hulkenberg is up to second - just 0.116secs behind Sebastian Vettel. Bottas is marginally further back in third. If this does turn out to be qualifying, they will be on the front of the grid, with Vettel set to receive a 10-place grid penalty. A reminder that the grandstands are empty in Austin on safety grounds. We have racing, but no fans. Sound the Bernie Ecclestone klaxon. F1's big cheese has walked through the doors at the Circuit of Americas underneath an umbrella that is four times bigger than him. Nico Rosberg has launched into action, jumping ahead of Mercedes team-mate Lewis Hamilton into fifth place. We're shown a shot of Pastor Maldonado wrestling with his Lotus - the Venezuelan just about steadies the ship. We have 40 minutes of FP3 remaining, the rain is worsening, but the times are improving. Felipe Massa's engineer has told him the next five minutes will be the best window to get a good time. Daniel Ricciardo is back out - he can only move up to 12th. A terrific lap from Nico Hulkenberg sneaks him up to third - it could be perfectly timed with the rain worsening. So now it's Sebastian Vettel (2:00.380) from team-mate Kimi Raikkonen. The Finns tells his team: "I have a lot of aquaplaning in the first sector." Valtteri Bottas, Lewis Hamilton and Nico Hulkenberg make up the top five. I wouldn't expect the cars to stay out much longer - the spray is everywhere. Confidence is building on the track, but Sebastien Vettel, who has now set the quickest time, tells his Ferrari team: "The rain is getting heavier. Box now." Don't forget, you can listen to live commentary by using the Live Coverage button on this page. I'd recommend it wholeheartedly. Despite that little imperfection, Lewis Hamilton has the quickest time - 2:02.561. He's followed by Valtteri Bottas, Sebastian Vettel, Fernando Alonso and Nico Hulkenberg. There is a feeling that more rain is imminent - so these precious few minutes could end up dictating the qualifying positions, should things not improve. Hamilton and Rosberg have both come a cropper. Hamilton aquaplanes and zig-zags off before recovering. And there's a spin for Rosberg, who may have damaged a wing in the gravel. "You've got no front wing," say Mercedes over the radio. There's plenty of experience out there now, with Lewis Hamilton and Nico Rosberg among the drivers on the track. Daniel Ricciardo has completed his lap - 2:12.758. Rosberg's leading time yesterday was 1:53.989. "Lots of water, but not too bad," Daniil Kvyat tells his Red Bull team over the radio. Friday saw a very sedate first practice in wet conditions end with Nico Rosberg top of the pile. In the couple of hours before second practice the Texas sky emptied every last bit of precipitation it had in it. And as a storm neared Austin, the sensible decision to call off proceedings was made. And while there was little action, I would still recommend reading Andrew Benson's assessment of how the weather might affect the rest of the weekend. Miracles of miracles... P3 has officially started. Karin gets Brownie points for being a dedicated reader - yesterday's live text commentary descended into absolute farce. But we did get to discuss the highlights of James Marsden's acting career. We're hearing that there is a 10-minute delay as things stand. Different drivers obviously have different ideas about what is happening - Marcus Ericsson is in the cockpit ready to go, while Jenson Button is sitting back with his pipe and slippers. While we wait to find out if we'll see any cars moving today, why not have a chat with us? 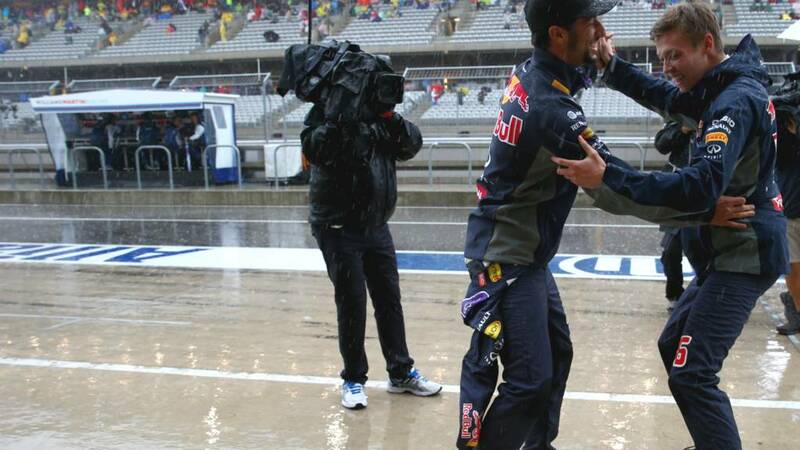 Tell us about your memories of F1 in the wet - great races or boring call-offs... Use #bbcf1 on Twitter to get involved. The pictures I'm seeing of the Circuit of the Americas are a bit creepy to be honest. No fans, no cars, no people - it's like a deserted fairground from an episode of Scooby Doo. As it stands, practice will happen in front of completely vacant grandstands. Here's an idea of what will happen if we get FP3, but no qualifying. “Overnight, the weather forecasts have proved accurate. It has been belting it down with rain and it is still going. Race officials are intending to be flexible with the schedule and run qualifying at any point where it looks like there might be a window where the cars can properly run. There are some contradictory messages coming out of the Circuit of the Americas. We know for certain that spectators will not be allowed into the circuit until 12:00 local time (18:00 BST). But, as it stands, F1 bosses are still hoping to run final practice at 10:00 local (16:00 BST). That could change any second though - as we're expecting an update. The concern is not so much about the rain, but whether there is a danger of lightning coming from the storms caused by Hurricane Patricia. Sit tight folks. There are many notable Austins, including the three above (can you name them all?). But yesterday the word Austin was synonymous with one thing - rain. The Circuit of the Americas was subjected to a deluge that saw second practice washed out. Will it be any better today for final practice and qualifying? We're not optimistic.